A fisherman demonstrates how to prepare fish for the class. Teachers invited a community member to speak to the class about fishing and how to prepare fish. Inviting a community member to speak gives students opportunities to ask questions, be part of a live demonstration, and helps to spark an interest in an old tradition. Having a community member model activities and skills might give students new ideas to bring into their own play. Talking about fish in the warmth of the classroom. In the classroom, the students explored ways to group fish by their characteristics. They also compared different types of fish by measuring their length and width. 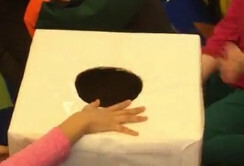 An ice-fishing box for students to practice and play with their new skills. With a little creativity, the teachers designed an “ice-fishing” centre. To simulate a frozen lake, they covered a box with white paper, cut out a hole on top of the box, and wrapped blue paper at the bottom. Equipped with tools like ice scoops, camping chairs, and their own seat warmers, the children demonstrated their ice-fishing knowledge. Cut outs of different species of fish were placed inside the box. 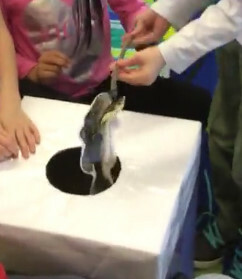 Students used rods made from short branches and yarn with magnets at the end of the fishing line. The fish also had magnets on them to allow for the rods to “catch” them. This design was very enjoyable for the students! 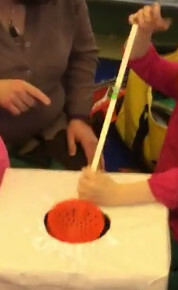 Throughout the fishing play, students were able to practice their language use. They were negotiating turn-taking, giving each other instructions, and all the while, using their own imagination to develop narratives. 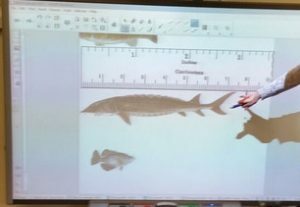 Students were also questioned by the teacher so that they could integrate the information they were learning and identify different kinds of fish. 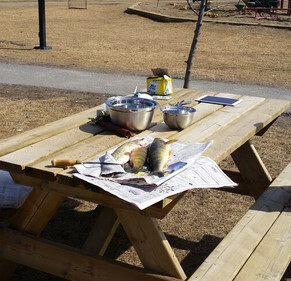 After catching many fish, students were able to take their catch and measure them out – just like real fisherman do! 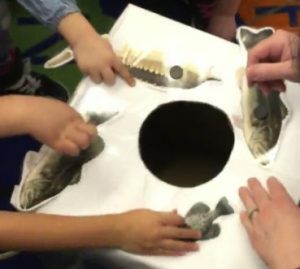 This activity opens a lot of opportunities for children not only to learn more about a winter tradition in their own community, but to also expand their oral language, their numeracy skills, and their scientific knowledge about fish. And of course, the children can enjoy their ice fishing laughing and learning in the classroom, keeping warm even on the coldest winter days! By nowplayblog in collaboration, community, dramatic play, play on July 30, 2018 .